Coconut oil has both long-chain and medium-chain fatty acids, but is made up mainly of the medium-chain fatty acids. In fractionated coconut oil, the long-chain fatty acids are removed. You’ll often hear fractionated coconut oil referred to as MCT oil, advises the Texas Department of State Health Services. 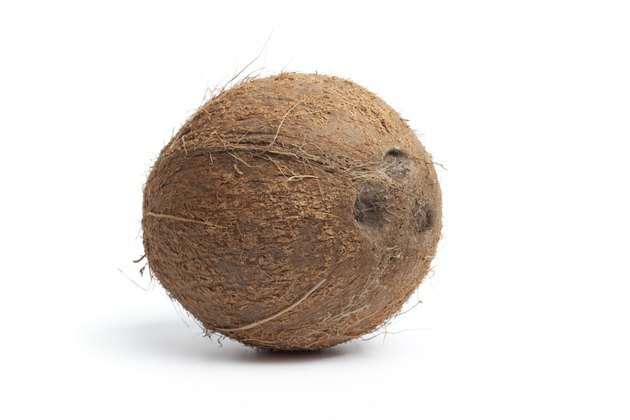 MCT is often sold for use in cooking, says Bruce Fife, author of “The Coconut Oil Miracle.” As cooking oil, it is extremely stable and does not go rancid easily, according to the Organic Facts website. Unlike other saturated fats, MCT oil does not contribute to a rise in cholesterol, advises the “Concise Encyclopedia of Foods and Nutrition,” by Audrey H. Ensminger. MCT also works better in weight-loss diets than olive oil, advise M.P. St-Onge and A. Bosarge, authors of a 2008 study published in the American Journal of Clinical Nutrition. Fractionated coconut oil is made by using steam and pressure hydrolysis of coconut oil into glycerol and free fatty acids. The fatty acids are then fractionated into the long- and medium-chain acids before medium-chain acids are recombined with the glycerol to create MCT oil, according to Ensminger. The medium chain fatty acids contained in coconut oil are capric acid, caprylic acid and lauric acid, says Fife. Coconut oil is especially high in lauric acid, according to Texas DSHS, which notes that not many food sources of lauric acid exist. In fact, the only other foods that contain significant amounts of lauric acid are human breast milk, goat milk and cow milk. However, when the oil is fractionated, the lauric acid is removed, leaving only the capric and caprylic acids, notes Fife. MCT oil contains about three-quarters caprylic acid and one-quarter capric acid, notes Ensminger. Fractionated coconut oil often is used in medicinal preparations, according to Texas DSHS. Regular coconut oil is solid at room temperature, but the MCT oil remains fluid at room temperature. This makes it good to use in soft gelatin encapsulated products like ibuprofen, according to “Oral Lipid-Based Formulations,” by David J. Hauss. The MCT oil also is easier to digest than long-chain fatty acids are, including those from vegetable oils and animal fats, and helps pharmaceutical products resist degrading due to oxidation, Hauss reports. You'll see fractionated coconut oil used in special diets and sold as a dietary supplement, according to Texas DSHS. MCTs don't require bile salts or the enzyme called lipase, which is primarily produced by your pancreas, for digestion or absorption, notes Texas DSHS. MCTs are used in hospitals to treat malabsorption syndrome and to improve mineral absorption as well as protein and fat metabolism. They're also in baby formulas used to nourish premature infants, according to Fife. A 2007 study in the Asia Pacific Journal of Clinical Nutrition found that MCT oil can help children who suffer from chronic diarrhea, says lead author Celeste C. Tanchoco. The study found that it may shorten the time frame of needed treatment and help the kids gain weight without leading to fat intolerance, vomiting or dehydration. Larger and longer-term studies are needed to confirm these results, Tanchoco notes. What Is the Effect of Olive Oil on a Person With No Gallbladder? How Many Calories In a Piece of Toast?